When you live in any country definitely you have to follow and respect the local culture. You have to know the habits of the local community. These should be followed respectfully. What country it is, you should do the habits you where live in. Here we talk about 8 habits you should do when you live in Russia. Russia is a country which plural in culture. They do their habit through generations to generations. This country is a multicultural country. Various cultures influence the variety of society. Some of culture in Russia such as the culture of the Orthodox Church, the Islamic Tatars, Orthodox Slavs, paganism and nomadic Buryat tribes. Russia is the country with the largest area in the world, its population is 147 million people. The Russian state has very advanced in technology, has huge reserves of crude oil, and has a space station, and is the first country to send humans into space. From the multicultural side of society, if we live in Russia we must be able to adjust. At least we can know the usual habits of Russian society. And the following are 8 habits you should do when you live in Russia. Some people love soup, they eat at lunch or dinner. When you live in Russia, one of the habits that you will definitely follow is eating soup in the lunch menu. One reason why Russians include soup during the day is because to keep it warm even in cold weather. Cold weather in Russia at least for months. 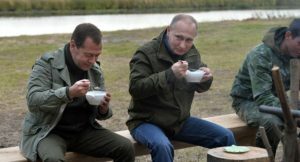 To keep the body warm the Russians eat soup during the day on their lunch. Hot soup to be one alternative to get menu a free from alcohol, to keep warm. And you can get soup menu easily, because almost all restaurants in Russia provide this menu. If you love soup it’s not a problem to eat soup every day. If you do not like it you should try to adapt. When you live in Russia, cold weather will give you a choice. If you meet Russian men, it would seem that they are serious people. The fact is they are humorous, they will tell anecdotes. The Russians are a humble and familiar person. When you chat for a drink together, please prepare for it’s your turn to participate in telling anecdotes. Please note that Anecdote is a funny short story. This story describes the actual events. The characters featured in the anecdotes can be famous people or common people. But there are times when anecdotes are written in fiction. In content anecdotes are packed to make the listener laugh, and to frown. Anecdotes can also contain satirical content. Can talk about everyday things as well as other things. For that if you live in Russia, be prepared to be able to tell anecdotes. There are times when you will be invited to your friend party. Or you have a party and you invite your colleague. Do not be surprised the Russians will bring gifts to your party. When visiting neighbors, friends, or colleagues, Russians will always bring presents. It has become the culture and habit of Russians. When you live in Russia those habits will definitely affect you and you will follow it. So one of the habits of the Russians you will follow when living in Russia is always bring gifts when it comes to parties. If you want to try to play golf more challenging and exotic, visit and stay in Russia. The habit of Russians, is they play golf on the snow. This is very unusual. Various challenges in golfing, try to play golf on the snow. Even more challenging, Russians play golf with helicopters. When you live in Russia you can try this game. This game, golf with helicopters held annually in Russia. How to play golf with this helicopter is where players try to dribble big as fast as possible from the top of the helicopter. Players are assisted by pilots and navigators, while the arena is filled with challenging obstacles. When you live in northern Russia, in the city of Norilsk there you have to get used to the darkness. The city is located 2,881 km from Moscow. This is something fun, where you are used to very cold weather and very long darkness. Not just the challenges of darkness and cold weather. In the city of Norilsk commodity prices are also so expensive. This is due to transport accommodation from central Russia. Food products can be very durable in cold weather. This is where you will get used to living in dark conditions for a long time. When you plan to travel, you must have prepared it well. Also when you leave, you will make sure what it takes. For travel by sea or air transport, anxiety will sometimes arise. Sitting before starting the journey can be one way to reduce anxiety. For people who are easy to panic, it can be to calm down. Sitting first, you can make sure whether or not something is left behind. And when you live in Russia this habit will be enough to help you, so the trip can be done well. In Russia sitting before leaving this journey becomes a habit and tradition. And this does help in overcoming the anxiety that exists. When you are on a flight some people will experience anxiety. Various flight experiences, you are trying to stay calm. When in Russia, you will find, when the plane has landed they will clap and cheer. Indeed in addition to Russia there are other countries that have this habit that is Italy and Poland. It is not easy for someone to reduce anxiety. For the Russians to clap can be an effort to reduce anxiety and feel relieved. When you feel happy and grateful for your journey safely, expressing it like a Russian is great fun. Expression of applause is also a form of gratitude and thanks, because the journey is safe, smooth to the destination. 8. When joining the queue, ask who is the last. When you shop and queue at the checkout payment. Sometimes there are things not fun. Others are grabbing your queue. Things like this will never happen if you live in Russia. The fact is that Russians always ask who is the last before they join the queue. No one will be taking the queue in Russia. And when you live in Russia, one of the habits you will follow is always ask who is the last before you get into the queue. When you know who the last person in the queue will position you correctly. You will not grab anyone else’s rights. They are 8 habits you should do when you live in Russia. If you decide to settle in Russia, will inevitably be carried away by the habits of there . If you are planning to travel to Russia, at least this knowledge will equip yourself.